Hedo Turkoglu, a veteran player who is a shell of his former self and having the worst year of his career, was suspended for 20 games by the NBA on Wednesday for testing positive for an anabolic steroid known as methenolone. Somebody needs to tell Turkoglu that PED stands for Performance-Enhancing Drug, not Performance-Extracting Drug. If Turkoglu is on the juice, he needs to call the trainer who gave him the stuff and demand his money back. It’s hard not to feel for the Magic and their fans. The news of Turkoglu’s positive drug test is yet another blow to a floundering franchise doing everything in its power to move past the Dwightmare on Church Street that haunted the franchise for two years. The Magic and its leadership triumvirate of CEO Alex Martins, general manager Rob Hennigan and coach Jacque Vaughn have been trying diligently to put a positive spin on a season that is circling the drain. And now, suddenly, the Magic are the Lance Armstrong of the NBA - without the championships. Only eight NBA players in history have ever tested positive for PEDs, and two of them have played in Orlando. The Magic have seen their greatest season tainted by steroids and now one of their worst seasons, too. Rashard Lewis, the Magic’s second-best and highest-priced player, was nailed for PEDs during the 2009 NBA Finals against the Lakers. Lewis was suspended for 10 games at the outset of the following season because of the positive drug test. Lewis, after testing positive for a testosterone-producing PED known as DHEA (dehydroepiandrosterone), told me back then he unknowingly ingested the substance after he purchased an over-the-counter nutritional supplement at GNC. Ironically, Turkoglu said essentially the same thing Wednesday when quizzed about the positive drug test. He said that, while back in his native Turkey during the off-season, his trainer gave him a medication to help him recover more quickly from a shoulder injury. “I didn’t know that this was a banned substance and didn’t check before taking it,” Turkoglu said. Sorry, but I’m not buying Turkoglu’s explanation, and neither should you. As sports fans, we’ve been deceived too many times to give any drug cheat the benefit of the doubt. Seemingly every athlete ever suspected of using performance-enhancing drugs lies, cries and denies before ultimately being forced to come clean (see Armstrong, Mark McGwire, et al.). A more likely and believable story is that Turkoglu, 34, is an aging athlete who saw his ability drastically decreasing and was desperately looking for a shortcut to prolong his career. 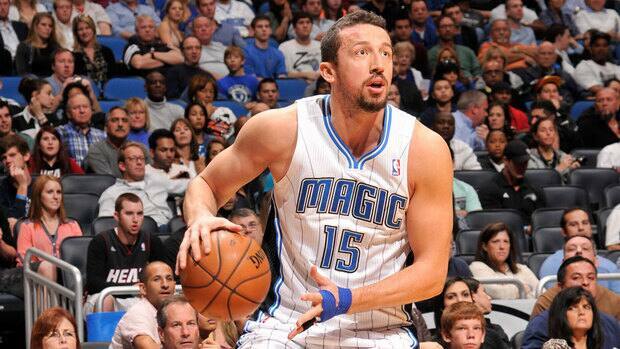 I also think Turkoglu is just one of many NBA players on PEDs. I’m speaking as a sportswriter who’s written a lot of columns about drug cheats in every sport, and I say yes. Superstars in nearly every athletic endeavor have been nabbed for PEDs; why would the NBA be immune? The reason is simple: Because for years the NBA has had the weakest drug testing of all the major sports. The World Anti-Doping Agency has said the NBA’s drug-testing policy is insufficient compared with those of the NFL and Major League Baseball. NBA Commissioner David Stern even laughably said once that he didn’t think NBA players would benefit much from PEDs. That’s right, he actually said with a straight face that performances in his sport - a sport where a premium is placed on running fast and jumping high - wouldn’t be enhanced by PEDs. It’s inexcusable for the commissioner of a league where athletes make more money and compete for fewer roster spots than other leagues to think his athletes wouldn’t take PEDs in order to earn a guaranteed $110 million contract. If a struggling, below-average player such as Turkoglu is taking PEDs to recover from injuries and improve his performance, are we really naive enough to think the top players in the NBA aren’t using?